Beech House in Onecote, near Leek, Staffordshire sleeps 8 people. 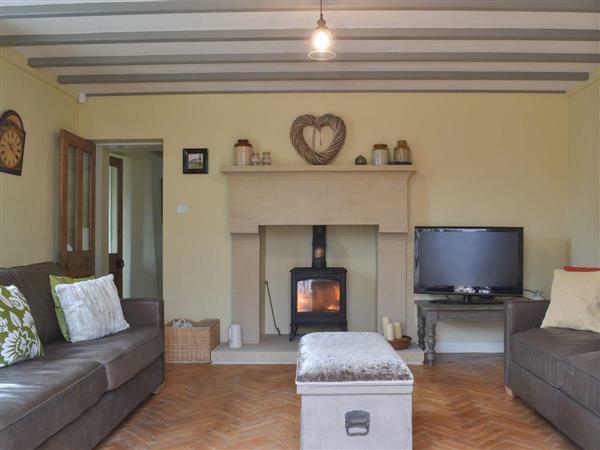 Beech House near Leek is a detached stone built house with exposed beams, crackling wood burners and a welcoming atmosphere. Beech House near Leek is full of character and charm with tastefully decorated bedrooms, offering a light and airy feel, and with lovely views over this attractive village; or why not escape to the living area with its comfy sofas and wood burner, a wonderful place to sit back and relax with your friends. Nestling in the village of Onecote, you can enjoy magnificent views over the rolling green countryside whilst relaxing on the decked area or in the landscaped gardens. Tempting though it might be to spend your whole time here, there is plenty to do within easy reach. The hillside market town of Leek, known as ’The Queen of the Moorlands’ is situated just 7 miles away, on the western side of the Peak District and is surrounded by lovely moorland countryside. The town has a charming cobbled market place and there are many examples of fine Victorian architecture influenced by William Morris - a reminder of the town’s prosperity when it was renowned as a silk manufacturing centre. Today Leek offers a wide selection of shops including vast antique emporiums, a good selection of restaurants, a local park and leisure facilities and real ale pubs. Situated close to Three Shires Head, the meeting point of the counties of Cheshire, Derbyshire and Staffordshire, Leek is near to Tatton Park, Styal County Park and Gawsworth Hall, plus Alton Towers theme park is approximately 30 minutes’ drive away. Let us not forget Ashbourne and Buxton, with its summer festival, Chatsworth House, Matlock and Matlock Bath with the famous Height of Abraham, all within easy reach. Beech House is the ideal place to unwind, relax and enjoy at any time of the year. The shop is 4 miles, with the pub and restaurant 200 yards from Beech House near Leek. Ground Floor: Living room: With wood burner, Freeview TV, DVD player, beams, wooden floor and French doors leading to conservatory. Dining room: With wood burner, beams and tiled floor. Kitchen: Galley style with electric oven, electric hob, microwave, fridge, freezer, dishwasher, washing machine and tiled floor. Conservatory 1: With French doors leading to garden. Bedroom 1: With double bed and en-suite with shower cubicle, toilet and heated towel rail. First Floor: Bedroom 2: With zip and link super king-size bed (can be twin beds on request) and en-suite with shower cubicle and toilet. Oil central heating, electricity, bed linen, towels and Wi-Fi included. Initial fuel for wood burners included. Large garden with decking and garden furniture. Private parking for 2 cars. No smoking. Holidays at Beech House run from Friday to Friday. For a better idea of where Beech House is, you can see Beech House on the map below. You can find more large holiday cottages (that's cottages which sleep 8 or more people) in Staffordshire. If you want to see more large cottages, have a look at large cottages in Staffordshire. Beech House is in Staffordshire; should you be on the lookout for a special offer, you can find all the special offers in Staffordshire. It's always worth checking to see what is on offer at the moment. Do you want to holiday near Beech House (UK4070), you can see other cottages within 25 miles of Beech House; have a look to find your perfect holiday location.